A new study by Queendom.com & PsychTests.com comparing the emotional intelligence of younger and older men reveals that the latter group continues to struggle against their emotional side. Young men continue to hold back from expressing their emotions. As boys grow up, they’re told to ‘man-up’, ‘toughen up’, or ‘act like a man’ when they face a difficult time, which translates to not showing any form of emotion that would be considered weak. It’s hard not to ignore the common theme of male characters in movies: The stoic silent type that doesn’t blink an eye in the face of danger, the bad boy who is always emotionally out of reach, or the gruff male character who prefers to display his feelings in actions rather than words. It seems that aside from anger, most male characters rarely show their emotional side. And sadly, it seems that art may be imitating life – or perhaps even the reverse. Analyzing data from 4203 people who took their Emotional Intelligence Test, researchers at Queendom looked into how men deal with their emotions. What their study revealed was an evident difference between the emotional attitude of younger and older men. While both groups (men under 40 and men over 40) still struggled to accept their emotional side, the problem was more prominent for the younger age group. 31% of men under the age of 40 struggle to identify their feelings (compared to 8% of men over 40). 31% of men under the age of 40 find it hard to express their feelings (compared to 17% of men over 40). Why? Well according to 36% of younger men, talking about their feelings requires a degree of vulnerability that they are not comfortable with (compared to 21% of older men). 24% of men under the age of 40 are uneasy displaying affection or appreciation; 23% are uncomfortable when expecting to console someone (compared to 13% of men over 40, in both cases). 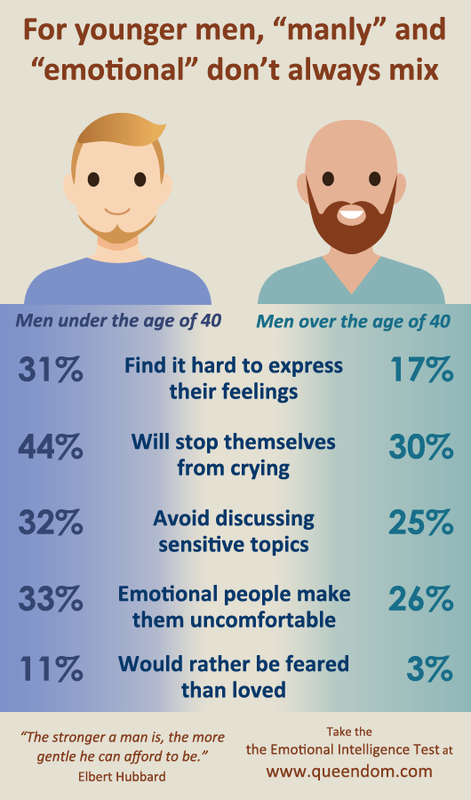 44% of men under the age of 40 said that they will do whatever they can to keep themselves from crying (compared to 30% of men over 40). 24% of men under the age of 40 have difficulty snapping out of a bad mood (compared to 13% of men over 40). 13% of men under the age of 40 have difficulty calming themselves down when they are anxious, 23% when they are angry (compared to 8% and 14% of men over 40, respectively). 18% of men under the age of 40 get angry or sad when the smallest thing goes wrong in their life (compared to 8% of men over 40). 32% of men under the age of 40 admit that they are incredibly impatient (compared to 26% of men over 40). 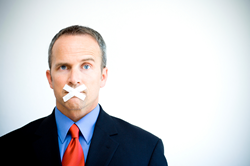 32% of men under the age of 40 avoid discussing touchy or sensitive topics (compared to 25% of men over 40). 33% of men under the age of 40 indicated that people who are overtly emotional make them uncomfortable (compared to 26% of men over 40). 23% of men under the age of 40 said that they don’t know what to say or do when someone gets upset around them; 18% said all they want to do is get away from the person (compared to 11% and 8% of men over 40, respectively). 46% of men under the age of 40 feel awkward in social situations (compared to 33% of men over 40). 17% of men under the age of 40 said that when they make a decision, they “rely purely on logic” rather their gut feelings (compared to 8% of men over 40). 11% of men under the age of 40 said that they would rather be feared than loved (compared to 3% of men over 40). For some men, “Connect with my feelings” does not top their list of priorities.Compared to older men, younger men find it difficult to face their own as well as other people’s emotions.